Fattoria il Lago offers the opportunity to spend your holidays in a real Tuscany working farm a few kilometers from Florence, producing DOCG Chianti wine and extra virgin olive oil. The farmhouse is located in a beautiful panoramic setting and offers self catering apartments situated in the vast green landscape of Mugello. The apartments and holiday villa rentals are divided between two restored hamlets. With a large panoramic pool, over 400 hectares of land to explore, three lakes and the convenience of a small Tuscan town for restaurants and shopping, this will be your best vacation ever in Tuscany. The family run vineyards and holiday apartment rentals are located in the lush countryside southeast of Florence. As you wind down the pleasant country road, you feel the fresh air restore your spirits and revitalize your vacation enthusiasm. The 8 self catering apartments and three independent accomodations/private villas boast a typical Tuscan style decor and each include a fireplace and independent heating system. The ceilings with their polished oak beam ceilings and traditional Tuscan terracotta tiles, maintain the original character and charm or the fully restored “borgo” (Italian for small town.) Fully furnished with bed, bath and kitchen linens you will find that the homes offer modern appliances and furnishing. The exclusive holiday apartments are situated in two little villages within the farm: Borgo La Villa and Borgo Il Lago. The first one offers a suggestive location overlooking the surrounding valleys, the property vineyards and one of the three lakes of the farm. There are 4 self catering apartments ranging from 65-120 square meters each with a private entrance and three or four double bedrooms. There is one independent Tuscany villa for 12 persons, and a spacious floor plan (320 square meters) and 6 double bedrooms. This borgo also has two independent apartments for 6 or 4 persons and an door game room with activities for all ages. A short distance up the hill is Borgo Il Lago with 4 bedrooms each with 2 double bedrooms and a private bath. This small village once held the antique wine cellar, but it has been transformed into a panoramic and charming banquet hall for family parties, weddings, get togethers and reunions. The apartments were designed not only to maintain their many elements of the historic architecture but also to add personality and comfort to your holiday accommodations. The farmhouse offers many services to make guests feel at home and comfortable! Sign up for the winery tours and taste the delicious wines and extra virgin olive oils grown on the property. Guests can fish at the three lakes on the farm's properties, go hiking along the posted paths, enjoy relaxing massages, request traditional Tuscan cooking lessons, a personal chef or relax by the swimming pool. The agriturismo has a children's play area, as well as a recreational room, and internet access in the main reception building. A wi-fi connection is also available for personal laptops. There is a private chapel on the grounds which is perfect for a special destination wedding. Within short distances from the farmhouse, guests can enjoy tennis or horseback riding, as well as visits to a local cheese factory. There are also many small villages in the area that are perfect for enjoying Tuscan living. The farm, the self catering apartments and the independent villa are only 2 km from the small town of Dicomano, where you will find good Tuscan restaurants, pubs, shops and supermarkets. 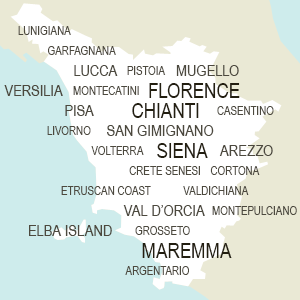 Florence is 35 km from Dicomano, reachable in only 40 minutes by car or with an easy train ride.